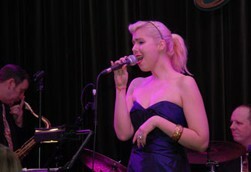 Blue Harlem is a 5 to 11 piece swing band playing the classic songs of Gershwin, Porter and Berlin, as well as original material, comprising female vocals with a 4 piece brass section. Blue Harlem hit the bandstand running. Formed by Al Nicholls in early ’96 (he served his time with Big Town Playboys, King Pleasure and Ray Gelato’s Giants), the members kept meeting in other groups so it seemed natural to get together – for good. Their love of the music of the golden swing era, and the classic songs of Gershwin, Porter, King et al means that stylistically they are all hip to the same muse. With the likes of Nat ‘King’ Cole, Ella Fitzgerald, Louis Jordan and Count Basie as their heroes, you can be sure the band will get you jumping. Their extensive repertoire ranges from the big-band sounds of Glen Miller to the rock ‘n’ roll of Ruth Brown and Etta James. Festivals played by Blue Harlem include Molde (Norway) International Jazz Festival, Soho (London) Jazz Festival, West Wales International Jazz Festival in Aberystwyth, the Bath Fringe Festival, Ghentbrugge (Belgium) International Jazz Festival, and the European Film Festival in Dresden, as well as festivals at Bures, Chichester, Coventry, Colne, Gloucester, Guisborough and Salisbury. The band are now regulars at the world-famous 100 Club, as well as playing many other London venues including the Barbican Centre, the South Bank Centre and Jitterbugs. They have an enviable reputation as a party band, having played for society weddings at venues across the UK from The Grand Hotel, Brighton to Melkleour Castle. They have been invited on three occasions to perform at Highgrove House charity balls for the ‘Prince’s Trust’. In a world over-populated with low-energy soundalikes, this is a group of Olympian musicians with enough wattage to light up Broadway on a busy night. It’s not for nothing that they say ‘Follow your feet!’.